Footage shows the moment a digger driver ploughed into a new hotel building during a remarkable rampage. The video was captured shortly before 3pm today when the plant vehicle can be seen mounting the steps in front of the hotel at Liverpool Innovation Park on Edge Lane. After reaching the top of the steps, the arm of the digger is sent crashing through the glass at the top of the door before tearing through the entrance. A few moments later, the digger rolls back out of the entrance and down the steps but the determined operator heads back up and through the front door. A number of workers can be seen cheering on the driver while videoing the incident on their phones - others appear to be trying to stop him. On the Travelodge website, the hotel is listed as "opening soon", but this could now set back their plans as extensive damage was caused to the structure of the building. "We are appealing for information after damage was caused to a hotel under construction in Liverpool today (Monday 21 January 2019). 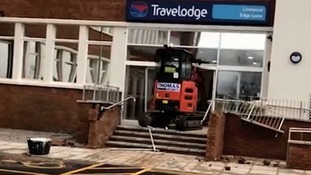 "A report was received shortly before 3pm that the digger was being driven into the entrance of the Travelodge building in the Liverpool Innovation Park. "The driver then left the vehicle and made off on foot in the direction of Edge Lane. "One man experienced eye irritation due to exposure to diesel and was treated at the scene by North West Ambulance Service. "It is not believed anyone else was injured during the incident. "Merseyside Fire and Rescue Services and contractors attended to ensure the site was safe."